This is brilliant documentary and true story about genius individual pursued by hand of law for simple reason to set an example of him in ongoing digital age. Pressure and fragility of this young boy led to his suicide and instead of example he became martyr of digital oppression. The internets own boy written, directed, and produced by Brian Knappenberger is true story about one and only Aaron Swartz. Really bright and curious kid who became major strength of his generation when it comes in rights and legals of internet community. I will not go too deep in technology in this review, even biography, since it is all explained in documentary and here on his website aaronsw also on wikipedia also, dont be lazy there is host of information on search engines. What hit me the most in this documentary was seeing brothers, mother, father in such great pain which can be brought just by righteous and honest, almost godlike anger with such power and sense of loss at same time. Seeing this from Aarons family members, mentors and peers is contagious and i am sure tear will be spilled on your end too. Being from youngest of age bent on learning and expanding knowledge, Aaron contributed to lives of everyone who is using internet, for anything today. Even if you dont know it, you probably used some of his solutions. So this is documentary which is fully available for download and presentations are encouraged, it was kickstarted and published under creative commons license which by the way, Aaron contributed on. Imagine that, boy, a kid, thinking how to make more suitable rights package for new era. Clearly laws and regulations that maybe worked on paper during ages are completely inadequate for modern on line society. Locking up of public knowledge behind private company firewalls is not just wrong, it could prove deadly. Everyone must have access to knowledge that can spark light of idea, you never know who has in their head solution for humanity, even minor one. You never know how next person will read any data therefore limiting access to knowledge is not just destructive for everyone but rather exponentially destructive in long run. From my personal perspective i never could understand intentionally hidden explanations, knowledge, studies! Maybe web generation is more open to this idea of sharing and caring than old "hard hand" style of obscurity. What i mean to say is that i always try to answer any question with cleanest and most accurate answer to avoid trolls and stupidity, so intentional hiding off anything that can be of better good/use is pointless, again imho. In world where gifted kids think of new ways to combat cancer or solve pollution for high school project, overnight. Locking up patents and ideas as corporate asset is crazy. Aaron wanted to change that, some of knowledge that he freed, and was actually already public domain, was already put to good use when some other random kid Jack Andraka investigated this. Mind you Jack had just little portion of just that one single scientific database, data collection, and he discovered completely new way for early cancer tests. Test that is already saving lives. So we have a kid, young man, Aaron here who just wanted to really make public scientific data available in real public use. 7 billion eyes see much better than few selected payees is and always will be truth. This is why state, country, government, DA decided to push this brilliant kid as far as they can, even further. Just like he was not their own kid, best of the best their own country produced in very, very long time. I was and am so sorry of his family for two years now, even more after watching this. But also am sorry and sad for all whistle blowers and truth tellers who got hit right in head instead of rewarded in these crazy times. This practice of ending people, one way or another, who tell the truth must stop, because living on planet where everyone just runs around, lie, cheat and steal is will be no fun at all, but will look like that if things dont turn around. 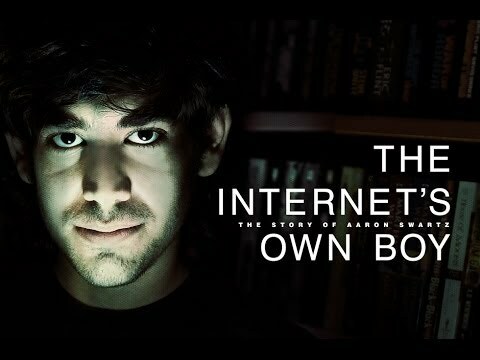 Show this film, "The Internets own boy", to everyone you know because it is must see! Recommended watching and it can be done here, here or here, free, factual, emotional and open, as Aaron would like it. sparot: "i watched great documentary about aaron swartz written, directed, and produced by Brian Knappenberger."